"A Leader in the Deck Maintenance Industry" | Deckshield International Inc.
Back in 1996, Deckshield was leading the way in developing the deck maintenance industry. 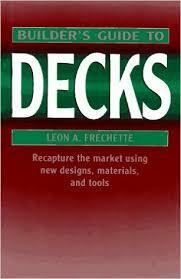 During that year, McGraw-Hill published a book written by Leon A. Frechette called "Builder’s Guide to Decks". That was one of the earliest references made to "Professional Deck Maintenance" companies and Deckshield was quoted as being the "leader in the deck maintenance industry". It was a wonderful experience to write for that publication and it provided needed credibility to the industry. It’s amazing that we undertook that project over 20 years ago... seems like yesterday! For those of you who would like to read the "Deck Care Specialist" section of that book, you will find it on page 240 - 246.